How high are realtors´ and lawyers´ fees in Estonia? What about other property purchase costs? How difficult is the property purchase process in Estonia? Foreign individuals and companies are allowed to acquire real estate with the permission of the local authorities. There are legal restrictions on acquiring agricultural and woodland of 10 hectares or more, and permission from the county governor is needed. Foreign individuals are not allowed to acquire land located in smaller islands, or listed territories adjacent to the Russian border. Once you have found your desired property, a "pre-purchase protocol" is drawn either by the parties or the Notary. A pre-purchase protocol is the sale-purchase agreement that commits you and the seller to the property sale, and usually requires the payment of a 10% deposit. The sale-purchase must be notarized. The pre-purchase protocol is immediately binding and under Estonian law there is no opt-out period. The Notary also prepares the Transfer of the Ownership of the Real Estate and the parties sign it at the notary´s office. The next step is to pay the stamp duty at a commercial bank prior to apply for registration. There are no property deeds in Estonia. A notarized application is made to the Land Register to transfer the ownership of the property to the buyer in the Land Register Book. After this process, the title is legally valid. Public notice of the transfer must be published in the Official State Gazette, though this is does not affect the ownership title, the publication process is almost automatic. 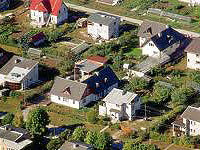 It takes an average of 65 days to complete the four procedures needed to register a property in Estonia. Real estate agent´s fee is around 2% to 4%, payable by the buyer. The smaller the property, the bigger the realtor´s fees will be in proportion to the property value. These rates are applied to the selling price. Notary fees are based on a table of fixed fees for property values up to 639,117. For higher values, notary fees have a progressive fixed fee plus a declining rate for each excess. A 20% VAT is also added to the notary fees. Stamp duty is based on a table of fixed fees for values up to 639,117. Stamp duty is 0.4% of the property value exceeding 639,117. How landlord-friendly is the law in Estonia?